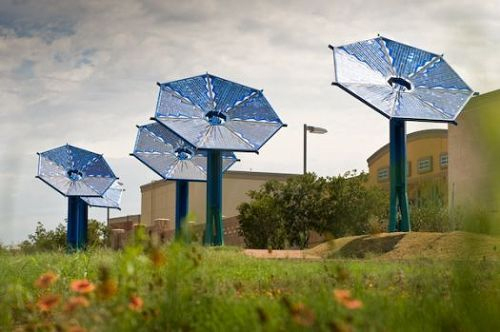 Recently, Austin, Texas, and retail shopping centers in high-speed road a space between the installed 15 solar panels like sunflowers. The crystallization of this technology and art, not only the development of green renewable energy use, but also to bring a fresh impression. Lighting power will be transferred back to the left near the power station, every day about 15 kilowatts. Evening, sunflower supply using solar energy absorbed during the day and blue LEDs (LED) lighting, shine in the night. 15 Sunflower solar panels located in the Interstate Highway 35 Austin Miller and between regions, interspersed with 1000 feet of green space. Designer is a Massachusetts artist (Mags Harries and Lajos Heder), which is fundamentally and 30-foot sunflower solar panels seems more like a work of art in the show. Technology, they absorb solar energy during the day, night blue light-emitting diode supply (LED) lighting. Remaining 15 kilowatts of electricity will be transported to a nearby power station, as it too can be solar panels sunflower maintenance costs. They also point to provide shade to pedestrians passing by as a public place. Sunflower from the seven separate from solar panels put together, can absorb the radiation in all directions, is a very good green design.